Jurassic World was a mammoth hit that seemed to divide critics. Some enjoyed the blockbuster sights and mammoth production, while others felt that such excitement came at the price of character development and common sense. But for those who‘d like a recap of the film, or simply want to enjoy it all over again, there’s an economical solution that allows viewers to get caught up in just 90 seconds instead of its two-hour running time. All that, plus it’s made with Legos! The Brotherhood Workshop assembled this short recap that hits all the highlights of the film (except for Bryce Dallas Howard running around in high heels, since Lego doesn’t make high heels). But it’s a great way to either revisit or get caught up on the summer blockbuster, all while enjoying some pointed jabs at Chris Pratt’s character not being as cool as Starlord, and a nice shout-out to Gareth Edwards’ Godzilla (“let them fiiiiight”). 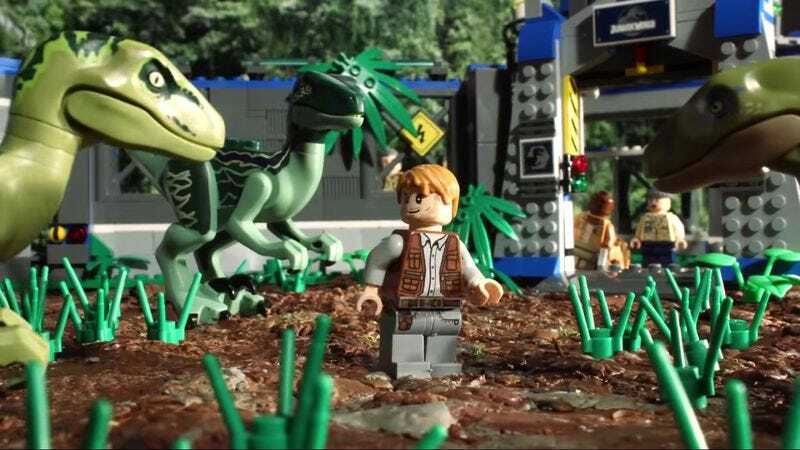 It’s a short and impressively made romp that shows off a lot of hard work in stop motion, as well as an attention to narrative economics, all in the name of producing a plastic highlight reel for the film.